HootSuite has announced a new single sign-on (SSO) feature for its corporate clients to authenticate both enterprise networks AND their HootSuite accounts with a single password. This is geared towards reducing the number of passwords required to log-in and ensure employees’ HootSuite accounts are linked to company network credentials. The upshot of all this is that Enterprise team members can now use their company email address to access their HootSuite dashboard. So any corporate network that supports Security Assertion Markup Language (SAML) can extend user-authentication for corporate accounts within HootSuite’s social media management dashboard. So, if you’re a network admin, you now have centralized control. With Enterprise SSO, you can manage access to HootSuite through your employee directory, and once an employee leaves the enterprise network and their company account is deactivated, their HootSuite account will also be deactivated. This gives admins the ability to keep track of all active accounts. Enterprise SSO should also help reduce the number of passwords in your network. There is no longer a need for a password to access your Enterprise network login and your HootSuite login. 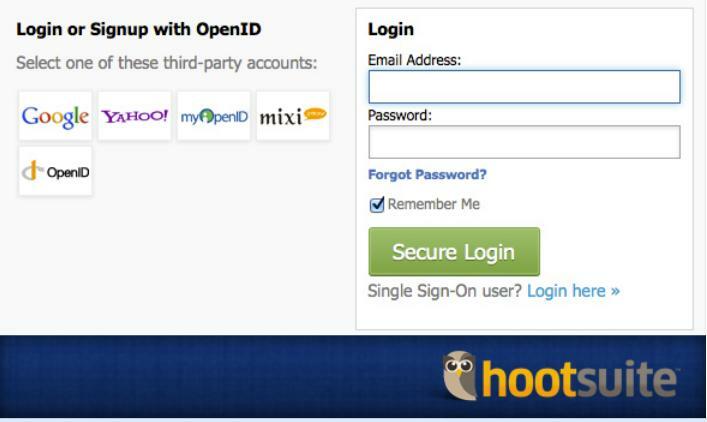 “Each user will now have one key to open both doors,” as HootSuite puts it. So…how do you access single sign-on? Visit HootSuite.com as usual and click the login button in the top right corner. Select ‘Single Sign-On user? Login here’, underneath the ‘Secure Login’ button. If you are already logged in according to the SAML identity provider, you will be logged in automatically to HootSuite; if not already logged in, you will be redirected to a third-party authentication server. Enter credentials for the SAML identity provider (the corporate network). You will be logged in to HootSuite and redirected to the HootSuite dashboard. Launched in 2008, HootSuite is a platform that lets users manage multiple social networks through a single dashboard, and the Vancouver-based company has grown into a global social media brand used by individuals and companies alike. It recently announced 4m users. Although HootSuite is used by both individuals and companies, it has been building itself as a fairly robust corporate social media management tool in recent times. Back in May, we reported that HootSuite had launched its ‘Teams’ toolkit for serious business users. With HootSuite Teams, the company offered more powerful permission settings – for example, users can control who can post what to which networks. This helps prevent rogue tweets from summer interns.